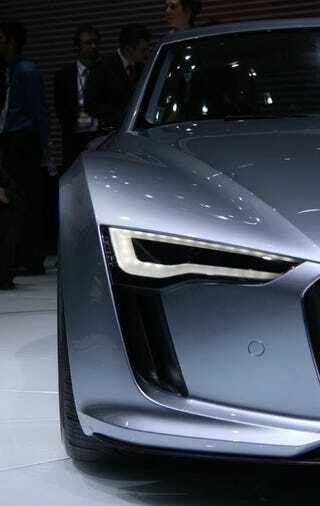 Audi President Johan de Nysschen called anyone interested in buying an electric car an "idiot" but that hasn't stopped the company from making another all-electric concept also called the Audi e-Tron, the second electric sports car since the Johan's remarks. Audi President Thinks Chevy Volt Buyers Are "Idiots"
This latest e-Tron is probably most appropriately interpreted as the basis in design for the next generation Audi TT, it's a bit lower and wider with the cabin set further back in the chassis, a compact GT if you will. We're really digging the flying buttresses festooned with carbon-fiber gills. Under the skin is where the silliness begins. The e-Tron 2, Electric Boogaloo draws power from a 45 kWh lithium ion battery which is fed to a pair of electric motors with a combined output of 204 HP and "1954.54 lb-ft." We're assuming Audi's playing the game of measuring the torque figure at the wheels after gearbox multiplication. It's a concept car, so the claimed times of 5.9 second 0-63 MPH and range of 155 miles are estimates at best. Audi also went on to confirm they were completely side stepping mild hybrids and going ahead with a full hybrid A8, which we'll see at the Geneva Auto Show.